KANDAHAR, Afghanistan (AP) - A U.S. helicopter bombed a house in a village in southern Afghanistan killing 11 people, four of them children, Afghan officials said Monday. The U.S. military confirmed a weekend raid in the area, but said only that it had killed five armed militants. Abdul Rahman, chief of Char Chino district in Uruzgan province, said the attack occurred at around 9 p.m. Sunday in Saghatho, a village where U.S. forces hunting for Taliban insurgents had carried out searches the day before. "They were simple villagers, they were not Taliban," Raham told an Associated Press reporter by telephone in the southern city of Kandahar. "I don't know why the U.S. bombed this home. We have informed our authorities." The governor of Uruzgan, Jan Mohammed Khan, confirmed Rahman's account that four men, four children and three women were killed in a U.S. bombing. He said U.S. authorities told him they spotted ammunition during their search of the village, which apparently raised suspicion. During the search, "the people were afraid, they started running," Khan said. In Kabul, U.S. military spokesman Lt.-Col. Bryan Hilferty confirmed a weekend air strike north of Deh Rawood, a town in Uruzgan province where the U.S. military has a base. "Coalition forces engaged from the air and killed five armed anti-coalition militia members," Hilferty said. Hilferty said he had no information about any civilian casualties. "The coalition does have stringent rules of engagement and we carefully weigh the use of deadly force," he said. Rahman said the 11 victims were buried early Monday in the village, where residents were "very afraid and very angry." If confirmed, the civilian deaths would be the latest in a string of botched raids by the U.S. military. On Dec. 5, six children died when a wall fell on them during a nighttime assault on a complex in eastern Paktia province where the U.S. military seized hidden weapons caches. 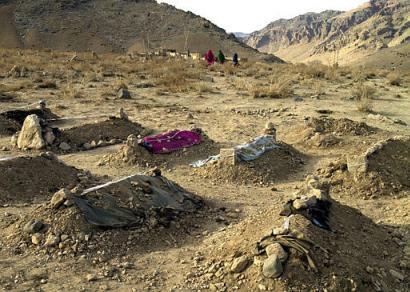 The next day, nine more children were found dead in a field after an attack by an A-10 ground attack plane on a mountain village in neighbouring Ghazni province. Both attacks were aimed at wanted militants, but no combatants were among those killed. More than 11,000 U.S.-led forces are hunting fugitives from the former Taliban administration and al-Qaida in southern and eastern Afghanistan.